Questions & Answers Regarding Francis and Gertrude Rogallo ... their life and works. Patents in which one of the two is inventor. Patents that reference their patents. Documents and articles that have significant information about the Francis M. Rogallo or Gertrude Sudgen Rogallo. [ ] Speech by Francis in 1989 Discussion? Analysis? [ ] .Inadequate historical accuracy by FMR on some points. Voids. Missed attribution opportunity. His focus and tunnel vision on some matters. [ ] From early history through 1800s and through 1950 and beyond: the triangle control frame in aviation. How public domain is revisited time and time again. [ ] Lowry or Lowery ????? No. 175C, Soc. of Automotive Eng., Apr. 1960. [ ] Rogallo, Francis M., Lowery, John G., Croom, Delwin R., and Taylor, Robert T.: Preliminary Investigation of a Paraglider. NASA TN D-M4-3, 1960. 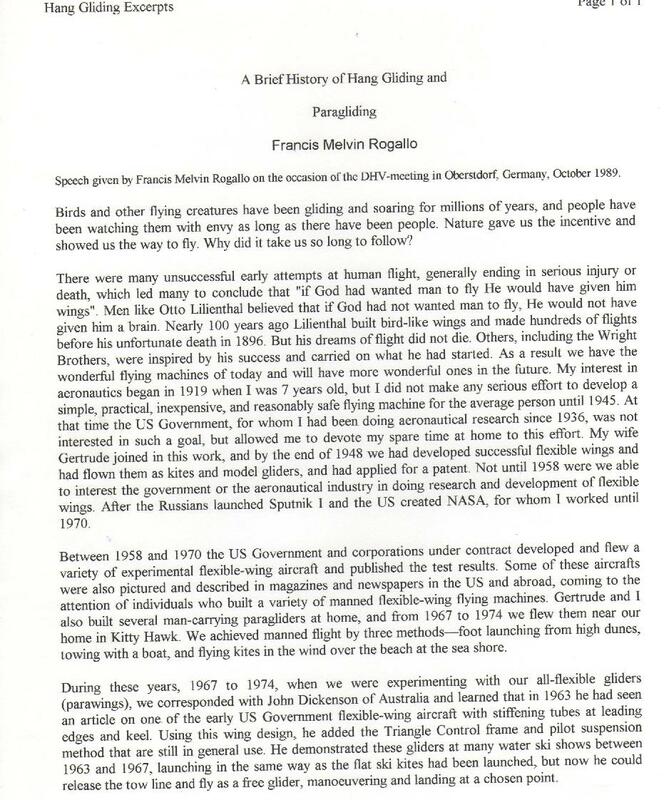 [ ] Rogallo, F. M., and Lowery, J. G.: Flexible Reentry Gliders. Preprint No. 175C, Soc. of Automotive Eng., Apr. 1960. [ ] Naeseth, Roger L.: An Exploratory Study of a Parawing as a High-Lift Device for Aircraft. NASA TN D-629, 1960. [ ] Hewes, Donald E: Free-Flight Investigation of Radio-Controlled Models With Parawings. NASA TN D-927, 1961. [ ] Zimmerman, C. H.: Preliminary Tests in the N.A.C.A. Free-Spinning Wind Tunnel. Paul G. Fournier and B. Ann Bell, Low subsonic pressure distribution on three rigid wings simulating paragliders with varied canopy curvature and leading-edge sweep. November 1961. NASA Technical Note D-983. "Inasmuch as the purpose of this investigation was to determine the aerodynamic effects associated with particular changes in canopy shape, rigid leading edges, keels, and spreader bars were used in order that a canopy shape under air load reasonably similar to that desired might more easily be maintained. In many practical applications, of course, it would be desirable to use the results obtained to design less rigid configurations that take greater advantage of the paraglider tension structure concept." Russell Hawkes. See USHawks for discussion. Rogallo, Francis M.: Paraglider Recovery Systems. 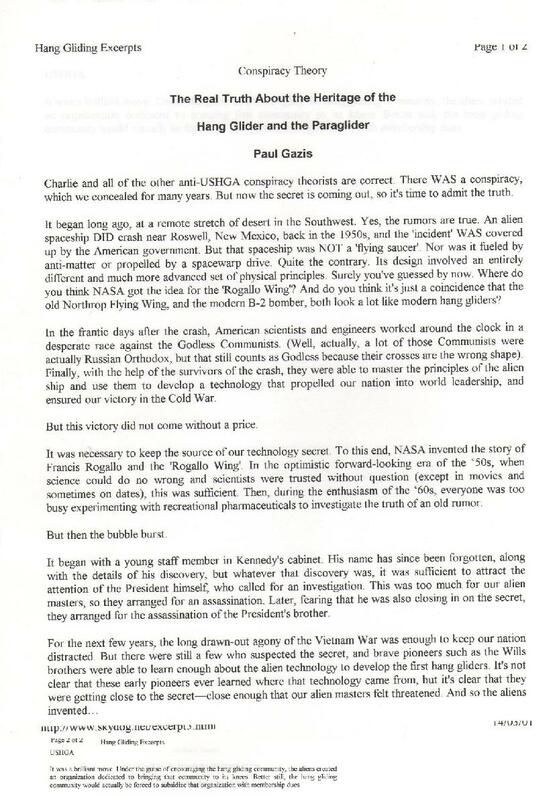 Presented at IAS Meetingon Man's Progress in the Conquest of Space (St. Louis, Mo.),Apr. 30-May 1-2, 1962.